As there’s no Captain Britain in Time Runs Out this week here’s some puzzles to help you pass the time. | The Captain Britain fans' page and blog. As there’s no Captain Britain in Time Runs Out this week here’s some puzzles to help you pass the time. This week in Avengers 38 and New Avengers 26 Time Runs Out continues, but sadly without any Captain Britain appearances. 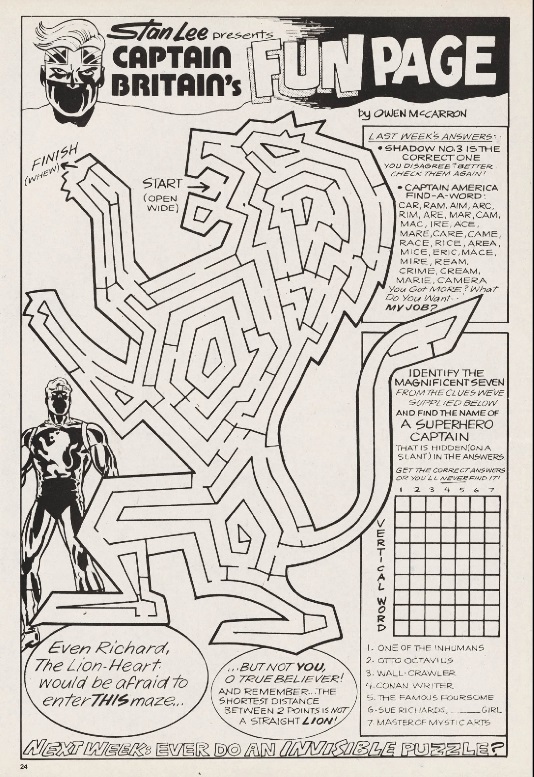 So to help you pass the time until Cap does show up here are some puzzle pages from the pages of Seventies Captain Britain weekly. 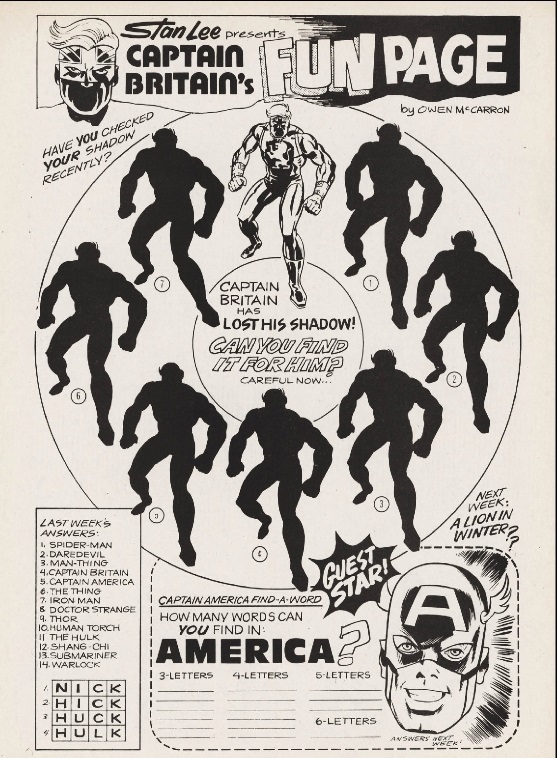 I’m not sure how Cap lost his shadow and why you need to be careful finding it again but that tag line for next weeks puzzle of A Lion in Winter sounds intriguing doesn’t it? Oh it’s just a maze. Would Richard the Lionheart be afraid of it? Sadly that answer is lost to history, unlike the terrible lion pun. You can keep up to date with Time Runs Out and other Captain Britain news by following The Captain Britain Blog on Facebook, on Pinterest, or subscribe to this blog by entering your email in the link top right. This entry was posted in Seventies Captain Britain and tagged Avengers 38, Captain Britain, Jonathan Hickman, New Avengers 26, time runs out by Richard. Bookmark the permalink.